Category Archives: Interviews with Magnetic Business Women! Not just another pretty pillow . . . 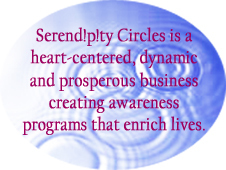 I met Nancy Lindgren several years ago when she came to Magnetic Business Women, the networking group that I created. Later she came to my house and I found out that we had a lot in common. I am excited to share more about Nancy with my readers and let you know what she is doing to make the world a better place. As you will soon discover Nancy has had her hands in a number of different ventures, just like a lot of us, but I want to focus most of this interview on her MoonLight Pillows. We have all heard the saying “Necessity if the mother of invention” and that is the place from which the pillow sprang. Nancy has always had an entrepreneurial spirit and she jumped into action to help a friend with cancer by making her a special pillow. One pillow to help a friend turned into a business which I will talk to Nancy about later in this interview. Katelyn: Hi Nancy, thank you for taking the time to share your story with us. I am excited for people to know about your businesses! To start out can you tell me a little about your background? Nancy: Sure, I was born and raised right her in Minnesota and grew up in Edina, Minnesota. My dad died in a plane crash when I was five and my mother raised myself and five siblings by herself. Growing up, I went to both Catholic and public schools and for college I went to the U of M and I was in the human services generalist program. I was pretty lost throughout my college years, struggled with alcoholism and chemical dependency and I am so grateful to say that I got treatment and have been clean and sober since 1980. I was married in 1982 to my love, Allan. We have two kids, a daughter who is twenty eight and a son who is twenty five. We are thrilled that our daughter is getting married in August. My real passions are doing intuitive energy healing, I like doing west coast swing dancing, love being anywhere in nature, I love to travel to different places. Katelyn: Have you always had an entrepreneurial spirit? If so where did it come from? Nancy: My mom was a pretty good sales person and loved to start little businesses re-selling things so she probably inspired my entrepreneurial spirit. Too bad there wasn’t EBay back then. She was also pretty intuitive too and always had a “hunch” that seemed to be right on. Katelyn: Do you feel that your mother was an influence on your choice to become an entrepreneur? Nancy: Yes, I think my mom was an influence on my becoming an entrepreneur mainly because she was a widow the young age 42. I didn’t witness much dependency on a male figure to get the job done. She did a lot on her own and that kind of independence was good role modeling for me. Katelyn: So what was your first entrepreneurial enterprise? Nancy: In 1986, I started one of the first environmentally safe house cleaning businesses which I had for ten years. I had the keys and alarm codes to seventy homes in the metro area. I hired and trained part time house cleaners and it all ran pretty smoothly. Katelyn: Wow, that’s amazing. What was the inspiration for going environmentally friendly? I imagine environmental awareness was just in its infancy at that time. Tell me more about the ups and downs of having your own cleaning business and what do your attribute your success to? Nancy: The cleaning business actually started a few years after school. I needed a part time job and my friend trained me how to do the cleaning business. I worked with him for a year. The inspiration for going environmentally friendly was two fold, one, I hated the fumes of the toxic cleaning products and two and I’m kind of a hippy at heart and love the earth so I wanted to have a positive impact. Restore The Earth cleaning products had just been created so I was able to buy in bulk from them. I love their products because they’re safe and they really work. I had great luck hiring part time house cleaners from the U of M paper and The Woman’s Press. I was so lucky that they stayed with my company for three or four years while in school which offered my clients the quality, consistency and trust they really appreciated. House cleaning is attainable success, you go in to a home that’s messy or dusty and dirty, you leave and it’s sparkling clean and smells fresh. Clients loved coming home to a clean home. Some of the challenges were when there was turnover, hiring and training new cleaners could be a lot to manage with two little kids at home. Once I had two women train with me for two weeks and they quit right away to start their own business. I was crushed, couldn’t believe they did that! Also, if something got broken while cleaning at a home, that was hard. Actually, it only happened once that it was a very expensive thing, a Tiffany cigarette box valued at 750.00, glad I was insured. The other times things were broken were incidental. You think about theft with a business like this. I was very fortunate mainly. However there was one cleaner I hired and trained who left right away. It was at that time a client complained that 40.00 was missing. I felt just terrible about that. I think the cleaner felt too guilty to stay on. I sold my cleaning business and started my private healing practice. Katelyn: Nancy can you tell us more about the healing practice. It sounds like a completely different direction from cleaning houses? Nancy: At the same time as I was running my house cleaning business I was studying intuition and healing, because I always thought it might be an avocation. I went to healing school at The Center For Wholeness for two years where I learned various energy healing techniques from Ron Moore, got my MariEL attunments from Ethyl Lombardi, levels of Reiki one and two, studied with Dr. Eric Pearl, took polarity therapy, various classes in transformational kinesiology. The last couple of years, I have been studying Holographic Memory Resolution (HMR) with Brent Baum and love this transformational work! Everything changed when I graduated from The Center for Wholeness as a certified healer and ordained minister. I use the ordination part of my ministry to perform custom weddings, funerals and baby blessings for people. I love creating these ceremonies with people. Oh the places you go! 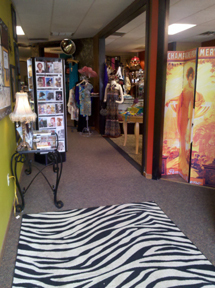 Shortly after my graduation I started the healing practice and I have been in the same office space since 1999. I am passionate about the transformation that takes place in a healing session. Ten years ago Nancy’s business MoonLight Pillows started with her desire to make a friend who had cancer feel more comfortable. This business has taken on a life of it’s own from what I can tell. Katelyn: I am really curious about the MoonLight Pillow business and how that came about. Could you tell the readers more about that? Nancy:Ten years ago my best friend got breast cancer. I had NO idea what women went through with incisions, drain tubes, discomfort, radiation burns and all the pain. I started creating stuff for her that I thought would help her feel more comfortable such as soft tee shirts with healing words on them for her tender breasts and a crescent shaped pillow that has become the MoonLight Pillow. • Protect against post-surgical wiggles, jiggles & bounces. • Support, cushion & protect tender area when wearing a seatbelt. • Keep the incision away from other body parts. • Cradle post-surgical breasts and upper arms while sleeping. • Provide something soothing to cuddle. 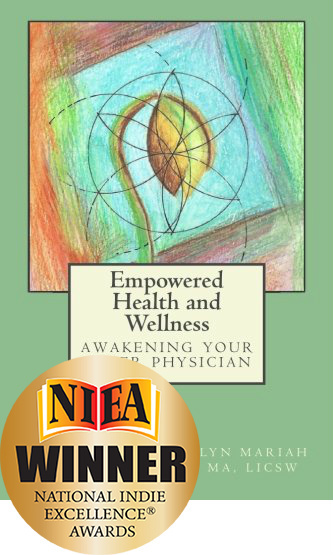 • Comfort for biopsies, lumpectomies, mastectomies, lymphedema, reductions & reconstructions. Katelyn-I am curious about what happens behind the scenes when you are in a business manufacturing a product such as the pillows, because I know a lot of women want to start businesses and might not know where to start so they never do. How do you find resources? How do you handle shipping and those types of things. Nancy: I know this may be a little confusing but I’m a healer and a minister and wanted to reach more people. I said to God one day, “Come on, use me! How can I reach more people?” Shortly after I had asked that question, opportunities started opening up at a pretty rapid pace for the breast cancer pillow I had created for my friend. The pillow is a healing product, it’s soothing and comforting, practical and soft so it fit in with my vision as a healer. Katelyn: My experience has always been that if the timing is right and there is a need to be filled the Universe steps in and things just flow like magic. It sounds like that is what happened with the pillows. Nancy: I didn’t have a clue what to do, I just made it up as I went along. I made lists of what I needed then started finding the right people and products to support the business. It seemed like one door opened after the next so I kept going. If the energy flows and feels right, I keep going. The first thing was finding sewers, I’m now much of a seamstress so I found a couple women who sewed the first pillows out of their homes. When I had enough stock of different sizes, I had them prototyped at the U of M Breast Center. They handed out my pillows to their patients. I met with the nurse manager and social worker and they gave me feedback on what size and fabric they liked the best. Then I needed to find the little tags to sew in and my brother in law knew someone. Then find a graphic designer to create some branding for the tags and marketing materials and I found the perfect woman for that. The business started growing and I needed more manufacturing. The real break through was finding the women residents at the Shakopee Women’s Correctional facility who have a fantastic manager in their sewing division. They have delivered a quality product for many years now. It’s win-win for everyone and meets a lot of needs on a lot of levels. The inmates tell me they get to do something meaningful & they get paid well in this job which is one of the better jobs in the facility. The MoonLight Pillows are made by women for women. The ripple effects are far reaching with all of the lives that get touched from the women who need them to the women who make them to those who gift them and so on. I do all the shipping and handling out of our home. I have a work station we’ve created in my basement with bins of different colors of pillows, bags and all the shipping materials there. My husband is now retired and he helps me with shipping orders, running to the post office, picking up orders at the manufacture and he does my accounting. I have both on-line retail and wholesale orders to fulfill. My biggest client is the Mayo Clinic who has a charity called Join The Journey who gives a MoonLight Pillow to each woman and man who has breast surgery there. They’re amazing with their outreach. More hospitals are now ordering the pillows. My sister-in-law has now started giving the pillows out to those in need by starting Melinda’s MoonLight Pillow Ministry. 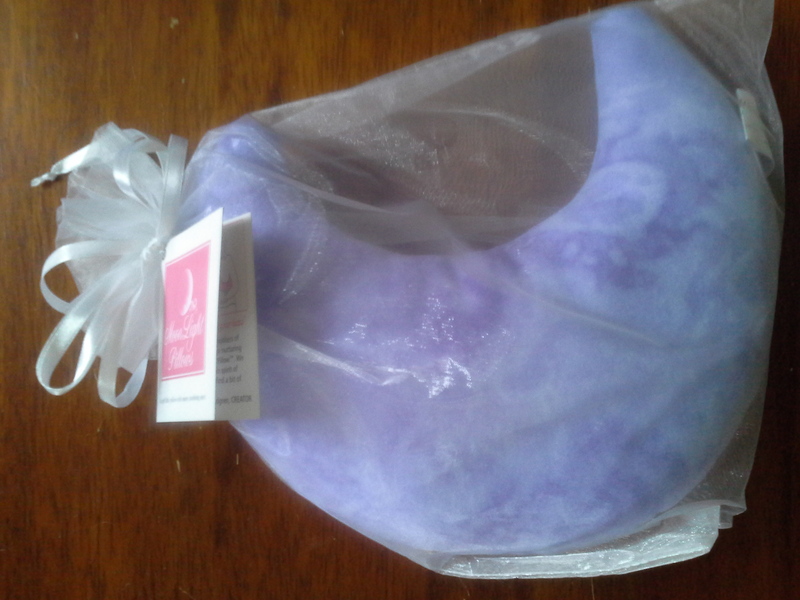 After going through breast cancer, she doesn’t want any woman to go through breast cancer without a MoonLight Pillow. I’ve manufactured thousands of these sweet pillows and it does my heart good to know that people are comforted by them. The feed-back is always heart warming. There you have a bit about Nancy’s wonderful story and how she is changing the world in both her healing practice and her MoonLight Pillow business. Please visit her website to learn more or to connect with Nancy. Contact information is below. Nancy sent me a pillow so I could see how wonderful it was. 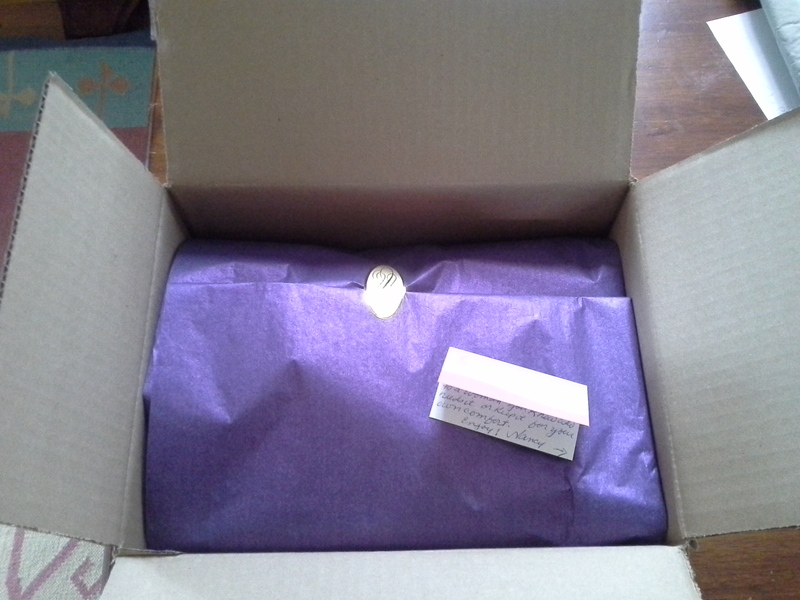 It was like opening a present when it arrived because as you can see in the photos it comes beautifully packages. Nancy doesn’t know this but I had the box on my table. I had recently gotten a new cat and my resident kitty was having a hard time getting use to sharing his house, his space and me with the new “intruder”. 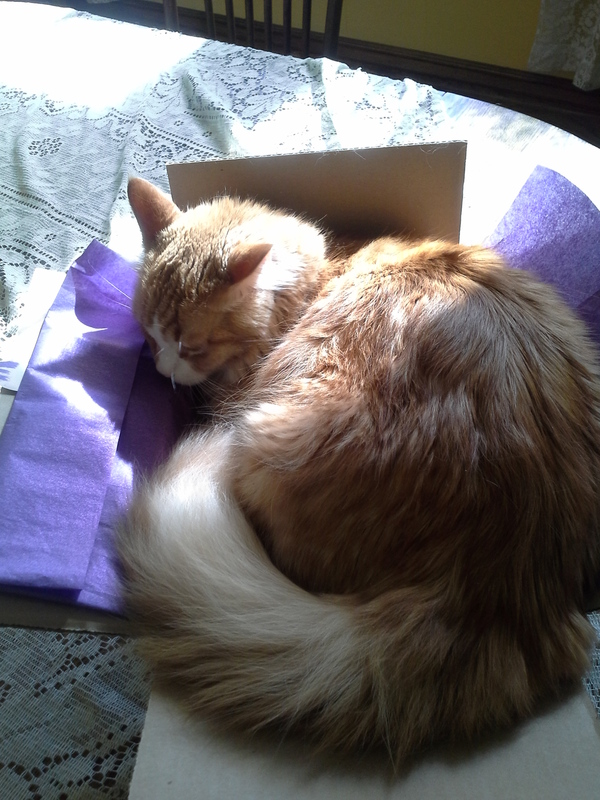 One night I was relaxing watching television and I looked over at the table and BJ, my kitty was in the box snuggling with the MoonLight Pillow. This beautiful pillow was comforting my distressed cat and he looked calmer than he had looked in days. That quote is from Mary Welch’s Serend!p!ty Circles Website. As you can see she is passionate about her work and facilitating change in the world. When she talks about it there is always a twinkle in her eye and excitement in her voice. I am excited to do this interview and share her work with others who might not know about the awesome work she is doing. My second purpose in doing the interview is to show other women what can happen if they follow their dreams and don’t give up. Hello Mary, thank you for taking the time to share with me about your business. I am excited for other people to learn about what you are doing to change the world. Katelyn Mariah: Have you always had the entrepreneurial spirit or is it something that you grew into over time? Mary Welch: I think it comes naturally to me. When I was growing up, it was called “independent and bossy“, not a leader or entrepreneurial! I was the oldest of 12 children, so I’ve been organizing and caring for others since I was 11 months old! I’ve consciously developed the qualities of a transformational leader over the last 35+ years. My strongest archetypes are that of Venus & Diana, who are both very independent energies. I am very focused and committed and my focus is on building relationships. That is what ignites my passion for doing women’s retreats. KM: Is Serend!p!ty Circles your first business venture? MW: Serend!p!ty Circles is not my first business adventure. After working as a Chamber Executive for six+ years in the 1990′, I ventured of on my own as a leadership consultant. I worked with several major businesses and churches and 2 cities. The work was satisfying, but I found my passion was working with women and creating experiences where they felt empowered and could tap into their deepest wisdom. In 1999, I partnered with two trainers and we produced a transformational training program. That partnership lasted a year and then because of our different perspectives on how to grow the trainings and how to facilitate the third level, I severed the relationship. I am truly a risk-taker and the dream was no longer a viable one for me so I went off on my own…again. I have absolutely NO regrets, either for being a partner with them or for breaking the ties when the time came. It was some of my greatest life’s learning, and my greatest joys in seeing the transformation of people’s lives. KM: Can you talk about your back ground at what lead you to create Serend!p!ty Circles? MW: All of the experiences of my life lead me to create Serend!p!ty Circles but the tipping point was an event that I helped coordinate as the Exec. Director of a Chamber of Commerce. At those town meetings, I watched professional facilitators use a ToP method from the Institute of Cultural Affairs and I was hooked! I said ‘ that’s what I want to be when I grow up!’ I was 43 years old at the time! I went on to finish my degree from Metropolitan State University. One of the classes I took was a JUNG class on Spirituality which included the work of Jean Shinoda Bolen on the goddess energies. 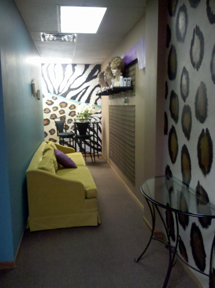 During that class the design of my first retreat was born. I was able to use my skills as a trained facilitator and designed a retreat that was spiritually based. That was the beginning of Serend!p!ty Circles. The spirituality component of my work is truly what I was called to do in this life time. As a child, God was always at the center of my life. As I’ve grown, my understanding of God has changed dramatically, and so has my understanding of myself. Numerous personal growth seminars/trainings helped me align with my purpose and they also taught me how to support people in their personal/spiritual growth. They also taught me what NOT to do! That is the entrepreneur in me. I wanted to create a program that used the best of the methods I had experienced; so I created my own. A new version coming from a softer, more feminine approach that empowers rather than destroys before it builds. 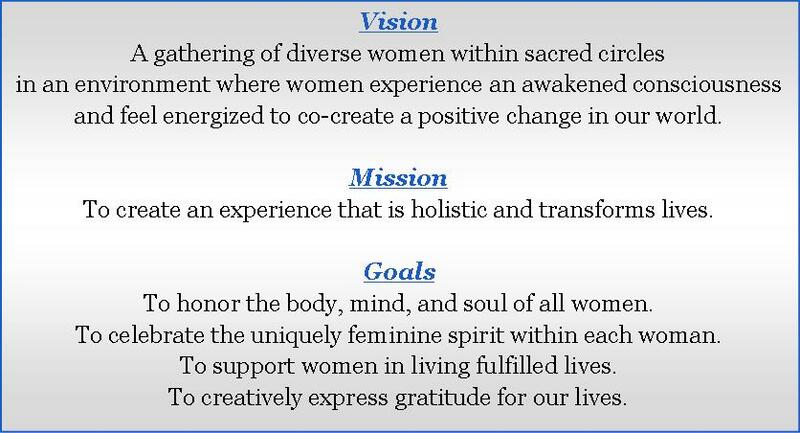 My work is all about creating a safe and sacred space for women to discover their true essence and feel proud and grateful. It emphasizes who we are BEing, not what we are doing and how to do it better. And in today’s world that is a rare approach…pretty entrepreneurial, I think! KM: As a business owner you have to wear a lot of different hats. Can you talk about the different hats you were, which ones are easy for you and which are more challenging. and sometimes even, the Cook! The easy ones for me are the Design and Facilitation which is my training and my passion. This is where I shine and my True Self comes through. I am in the flow of Spirit when I am in Creation and in the Circle. The most difficult part of the business for me is Marketing. It takes a skilled internet professional in today’s market, as well as time to do all the personal networking. I’m getting better at “closing the sale” because I am not afraid to ask anymore. I know with all of my heart and soul that my work is enriching lives and for those who are open to my work, they will come in the perfect time. KM:What would you like people to know about the events that your create? MW: I create event that are all about honoring the essence of each woman. The conversations we engage in are about who they are, not what they do. I use activities that are engaging and involve all of the senses. Add to that beautiful visuals, soul-touching music, flowers, something to eat and plenty of warm and loving hugs. The events are filled with laughter, healing tears and just plain FUN! Women leave the events feeling empowered, uplifted and wiser along with an AHA that brings clarity to their personal journey. The space that I create for the events is both sacred and safe and allows each woman to share their wisdom as I act as a facilitator of that wisdom, not a guru teach who knows it all. KM: Wow, Mary, that sounds so nurturing and supportive I can see how they can be transformational experiences for the women involved! KM: I think it is important when you are holding that kind of space for others, that you have ways to nurture yourself and keep focused and positive about your business when challenges arise. What do you do to take care of yourself? MW: I rely on my spiritual practices of meditation, qigong, affirmations, EFT, mindful walking, reading, and listening to CD’s. I also connect with other women and listen to their wisdom. Sometimes I just cry my eyes out to release the tension or discouragement! KM: Thank your for the last sentence. I think we all feel like doing that at times. We need to give ourselves permission to cry because it is so cleansing! Thank you so much for taking the time to share your life and business for this interview. To Learn more about Mary and the events that you can participate in go to Serend!p!ty Circles. She has a lot of exciting programs coming up that you will love. If You Need a Little Kindness, They are Dishing it up at the Q Kindess Cafe! I am excited about this interview because I want to share Lisa Metwaly and her story because I think you need to know about her! Lisa and her husband are the owners of Q Kindness Cafe in Downtown St. Paul. 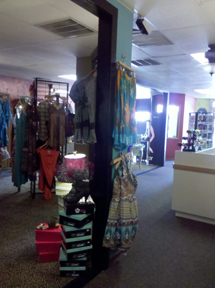 I love what they are doing in the name of kindness and how that has impacted their business. Lisa smiles brightly as she says, ” People dump buckets of love over my head all of the time.” I can see why, Lisa loves to do acts of kindness and share stories of acts of kindness. She is surrounded by kindness because, because of her passion for it and that make Lisa a kindness magnet! I was one of those kids going to one of those Doctors at the Lowry Building and I remember the Q. I don’t remember ever eating there but I remember it always being busy. About a year ago my friend Heidi took me to the Lowry Building to share the new treasure she had found, the Q Kindness Cafe. When I met Lisa that day, I knew I wanted to know more about her and she was one of my top picks for women I wanted to interview. The coolest thing happened when I sent Lisa the email to ask if she would do an interview. Early the next morning while I was still asleep I had a dream. Dream: Q Kindness was opening a new restaurant and I arrived for a meeting with Lisa when they were working on the front entrance. It had just been plastered and raised in the plaster where huge floral motifs, like a jungle, it was gorgeous. I was going to help Lisa roll out her new children’s menu by taking it around to kids to get feedback and give them a coupon to come in and try it. I had a plate of pancakes to show them a long with really cool, kid friendly menu. That was a perfect job for me because I had worked with children for years and could walk up to any child on the street and start a conversation and kids immediately connect with me. While we were talking Lisa brought out the yummiest sweet rolls and some kind of magic coffee that would break up the carbohydrates and gluten so they would just flush out of the body. That way you could eat the sweet rolls with no harm to the body. Pretty cool! While we were talking, a man came in who didn’t feel very good about himself and Lisa and I did a coaching session with him, in true Q Kindness fashion. I imagine that kind of thing happens a lot there. I woke up thinking about my dream, knowing the interview was a go, when noticed I had an email. It came in at 5:33 and it was Lisa saying she would love to do an interview. I think I was probably dreaming about her at the same time as she was emailing me. It was Friday the 13th, a day I have always considered lucky. 5:30 AM is Lisa’s usually time to catch up on-line because she is a busy woman. When she is not at the cafe she is a flight attendant for Delta Airlines. She has done that for 10 years. It sounds to me like it is almost a full-time job. How she juggles all of the balls I have no idea! When I told Lisa about the dream she said that one of her dreams is to franchise Q Kindness Cafe. With all of this synchronicity that dream might be closer to reality than she thinks. I think you are going to love this interview! Katelyn Mariah: Hi Lisa, thank you so much for having this conversation with me. One of the first things I would like to talk with you about is being an entrepreneur. Do you feel you have always had the entrepreneurial spirit or is it something you grew into? Lisa Metwaly: Ever since I was a little girl I loved to serve. My mom used to make little yarn poodles out of yarn and I remember going door to door to sell them. They were the cutest things, I felt everyone should have one in their own special color. As an entrepreneur, I believe it serves me well to want to serve others. My husband is the money and accounting side of the business and I am the community service and connector side. It’s who I am and always have been. We balance each other well. I keep spending time and money on others’ until he tells me I can’t. So far it has served us well. The more we help others, the more the business picks up. KM: Can you tell me what lead you to become the owner of Q Kindness Cafe? LM: The Lowry building, where we are located, used to be the Medical Arts building and we served the Doctors, Dentists and all those who visited them. 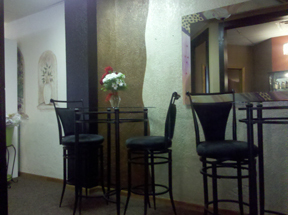 When the building was gutted and sat empty, our business suffered beyond your imagination. My husband and his partner decided to sell and found that no one wanted to purchase it so he had the brilliant idea that I buy the other partner out and do whatever I wanted with it. As a Certified Franklin Covey Life Coach, I put my coaching skills to use and co-hosted events called Make Mama Happy, which was a workshop for women discovered their gifts and fully gave these gifts with a “pay it forward” mentality. It was the start of the global kindness initiatives at the Q. We called it the Kindness Campaign. 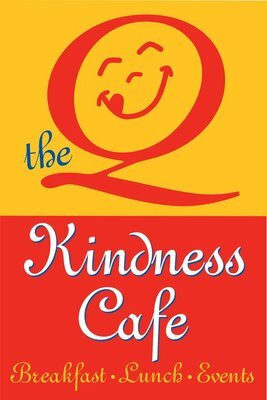 A fellow life coach and friend, Amy Zastrow, recommended the name change to the Q Kindness Cafe. Even after we had made all of our new signs with the logo, the name stuck. We reinvested in new signage and started our journey forward to become known as a restaurant determined to change the world with kindness. So many people have stepped forward to help with the business plan and re-branding process. I’m so grateful for the hands who have so willingly made this possible. Thank you for being one of those helpful people. KM: I remember the poodles you are talking about. I had a teacher who made them along with bunnies and other animals. She brushed the wool yarn so they were really fluffy and I thought they were so cute too! I love hearing about relationships that work as a true partnership like the one you and Jimmy have, it sounds like it works perfectly. Lisa told me that Jimmy is the kindest man she has ever met. He has a big heart. KM:The Universe has a way of getting us where we need to go, even when we want to go in another direction. It seems that all roads lead to our destiny. It appears that is what happened to you to with the closing of the Medical Arts Building and the door opening to Make Mama Happy Workshops, which I imagine has led you where you are now. Many people would have given up when the building closed. I think it is important for people to see that good things come out of staying with what we believe in. How were you able to hang in there and open to new possibilities? LM: There were many days that weren’t so easy. My husband is my primary resource to help me keep the faith. He told me, “There are good days and bad days, good weeks and bad weeks, good years and bad years. It all works out in the end when you keep the focus on what matters most.” I think of this often and keep the focus on what matters. I work hard to stay in integrity and provide value through a quality product in a loving environment. That love has come back to me ten fold through the random kind acts that happen at the restaurant. It really is a fun place to be, regardless if we’re busy or not in any given day. Every day can be full of surprises. When it’s quiet, we prepare for the busy days to come. We always plan to be busy. Being prepared and having faith is everything! KM:Life really is that simple, isn’t it? We humans complicate it! I love your husbands philosophy, always focus on the positive/what you desire and it will come back to you in surprising ways! With a background in financial services sales, as a flight attendant, and as a life coach, Cotter Metwaly has a lot of experience and inspiration to draw from. It’s mostly personal challenges that have induced her positive outlook on life. “You appreciate the mountain when you’ve been in the valley,” she said, shaking her head slowly. Her parents divorced when she was 15 years old, which led to a rebellious adolescence. Cotter Metwaly’s sister then died in a car accident in 1990. “A lot of people can focus on holding onto sadness instead of hope,” she said, but she chose to remain positive. It was her father, Cotter Metwaly said, who guided her throughout her life. “My dad always said, ‘I trust you, I trust you, I believe you and you can do anything.’ And that has influenced everything I do. I mean, give a person a reputation and they’ll live up to it.” She says she uses this idea to influence the kids and teenagers who hang around the café. As Cotter Metwaly spoke about her father, her voice wavered and she stopped mid-sentence. Eyes cloudy-a stark contrast to her ease when telling tales of kindness-she glanced around the room. “Instead of mourning for him I mourn for the people who didn’t get a chance to know him,” she said before adding, “He died a month ago.” She stopped, took a breath, but didn’t continue. After 30 seconds she had collected herself. She looked up, cocked her head and smiled again. 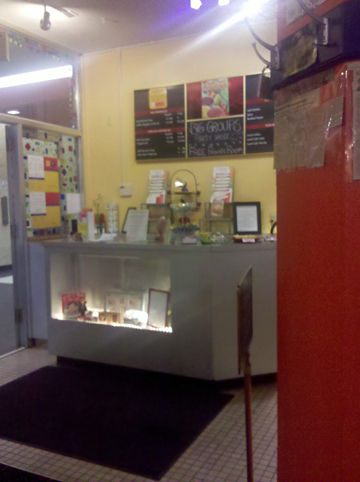 After the Q Kindness Cafe in downtown St. Paul was burglarized over the weekend, the owner didn’t get mad. She decided to respond in the spirit of her restaurant’s philosophy and practice random acts of kindness. Co-owner Lisa Cotter Metwaly’s reaction to losing $250, including $50 in waitress’ tips, is to amplify the kindness- she’ll give away $100 worth of hand warmers Wednesday to her customers who ride the bus. KM: And what happened with your test? LM: We got all of the money back and more. People stopped by the restaurant and slipped us a $20 or $5 and me got back more than we lost. We gave all of the extra money we got away. That is just one example of the obstacles that Lisa has overcome. In 2007 she was not able to work for a year because she wasn’t able to walk due to a severe problem in her foot. So she is no stranger to overcoming adversity and building a successful business. When I went to visit with Lisa at Q Kindness one afternoon, over a BLT, fresh squeezed lemonade and fries, the interview really got cooking. I left with so many things I wanted to write about that I have to find my top things so this interview doesn’t get too long. I chose the BLT because it is my favorite sandwich so I have become somewhat of a connoisseur of the BLT. I have had good ones and I have had bad ones. The one at Q Kindness is up there with the good ones, and the fresh squeezed lemonade was fabulous and I could taste the kindness that went into it. Liquid kindness, now how to that be anything but good! So if it isn’t obvious by now, Lisa is passionate about Kindness and doing random acts of kindness when ever possible. Just like with the Law of Attraction, the kindness she puts out comes back to her 10 fold. She has created a global kindness initiative called “Kinactors”. KM: Lisa I would love for you to talk about your kindness project, Kinactors. Can you tell my readers what it means and how they can get involved? LM: When we started this kindness campaign at the Q Kindness Cafe, I started to look at people differently. I never knew where the kindness was coming from when it was anonymous. I see kindness potential everywhere. I know that we all have it in us to help the world be a kinder place. Our marketing strategy is based on kindness and it has served us well in business but the kindness initiatives have taken on a life of their own. Thank you for allowing me to share them with you. We’d love for people to share their story when they receive a random act of kindness or hear about one at http://www.kinactor.com. Kinactor(kind actor/connector) is a word that we made up. ke’-nak-tor (noun) Someone who writes about kind acts to connect. 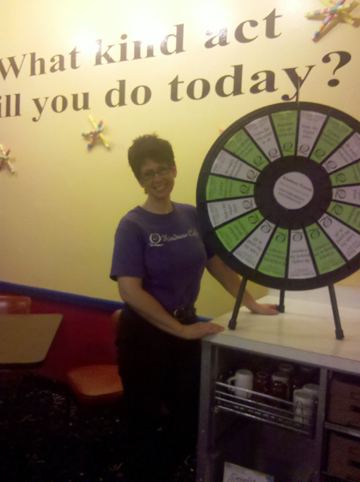 When we started the kindness campaign at the cafe, we had people from all walks of life coming in to share their story. I’d always pass the stories along to others’ at the restaurant or at various networking events. Eventually I realized these stories were meant for me to give in a much bigger way. We have a wheel of kindness that people spin that everyone loves. Whatever they land on is the kind act they do for the day such as buy coffee, breakfast, lunch and various treats. These are given away later when a random customer comes to order that item. We keep a list behind the counter and when something is ordered that is already paid for, it’s a random act of kindness. The person is asked to “pay it forward” and do something nice for someone in the future. A woman spun the wheel and landed on “share something” she emailed me saying she wanted to share her IPOD Touch , worth $350. She thought was could use it for a contest of some sort, which I was thrilled to ablige! Over 100 people posted kind acts on our Facebook page and we drew a random number at the end of the contest and gave away the IPOD. Out of this the Kinactor blog was born. Kindness really is everywhere and it’s that heightened awareness that’s needed for maximum effect on the world and you can share your stories on the Kinactor website. One of my favorite stories is the man who told me he disciplines his kids with a focus on kindness. He has a poster of kind acts up on the wall and when the kids misbehave, they are to go over to the wall of kindness and choose a more appropriate action that they will do next time. Another woman shared that same story only she made her kids write a report on the kindness action they will pursue next time. Another woman started a kindness patrol for kids in the fourth grade to monitor kind acts. The incidents of bad behavior went from the 300’s to the 30’s in only a few years time because the kids are more focused on kindness. Kinactor.com is a vision of hope for companies and people to connect and learn from each other; to create a culture of kindness wherever you are; to be more focused on kindness. KM: I encourage everyone reading this who lives in the Twin Cities to stop by Q Kindness Cafe so it is always busy and so Lisa can do what she loves to do all the time. If you don’t live in the Twin Cities, stop in when you are in the neighborhood. It will be the kindest think you can do for yourself. Filed under Entrepreneurship, Interviews with Magnetic Business Women! Interview with Mojo Bringer, Theresa Rose, Bring it on!! 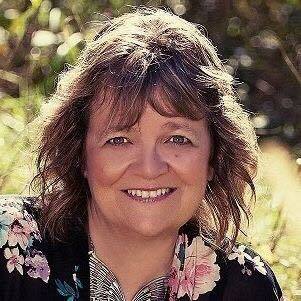 Theresa Rose is new to the Twin Cities and we are blessed to have her. She has already made an indelible mark on many of us. She is a speaker, author and most importantly a bringer of mojo. She is funny while touching you deeply. It is the mojo that I am really interested in! I am excited to interview her and share her with those who don’t know her. Prior to becoming a writer and speaker, Theresa owned EnergyWorks, a healing center that provided bodywork, yoga and energy healing services. 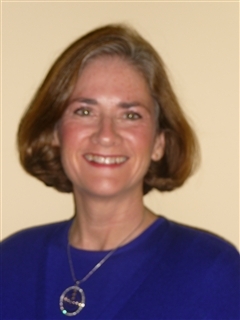 While at EnergyWorks, Theresa conducted weekly guided meditation workshops, was a nationally certified Reiki instructor, and taught yoga several times per week. 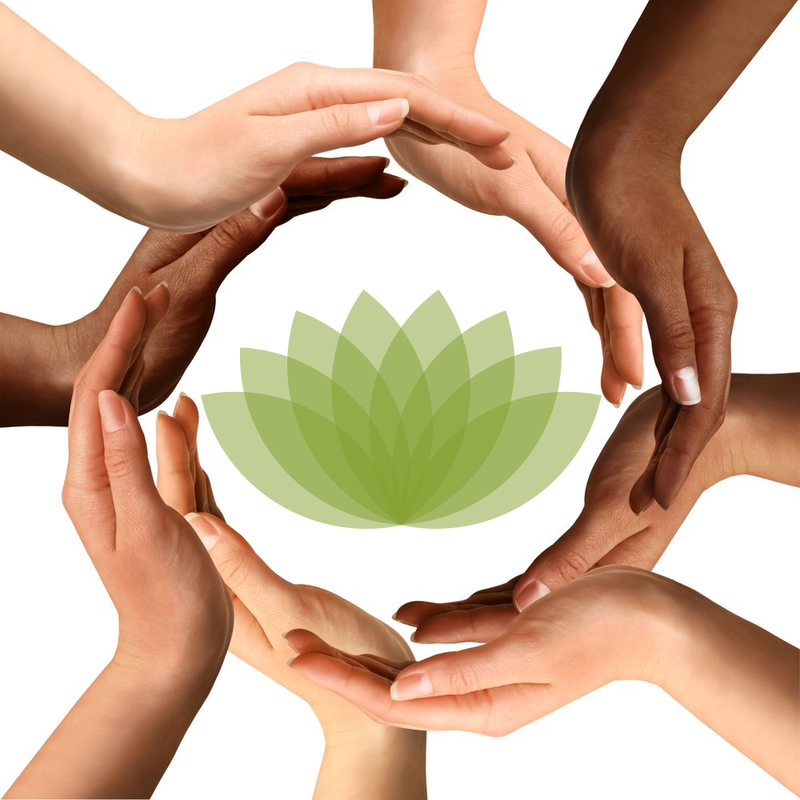 As a Licensed Massage Therapist, Intuitive Healer and Reiki Master, she had a thriving healing practice where she helped people unlock physical and emotional blockages, understand and transcend core life issues, and ultimately embrace their personal power more fully. Theresa is a former instructor at the Sarasota School of Massage Therapy, and a former hospice volunteer. Theresa is an Ordained Minister of Prayer from the Center for Sacred Studies, having completed a two-year cross-cultural ministerial training program with emphasis on indigenous ceremony, ritual and transpersonal psychology. She is currently a Ministerial Guide at Lake Harriet Spiritual Community, one of the premier spiritual centers in Minneapolis. Katelyn Mariah: I am a big fan of your work and the idea of bringing Mojo back into people’s lives. I am curious about how and when you were possessed by the entrepreneurial spirit and some of the forms it has taken. Theresa Rose: Even though I had my first job at age 13, I never really felt the calling to be my own boss. I held several positions in Corporate America over the years, from Senior Manager of Product Marketing and Development for a Fortune 100 multinational to a management consultant of a boutique consulting firm. However, when I found myself without a job due to layoffs, I moved out of the traditional business world and into alternative healing. 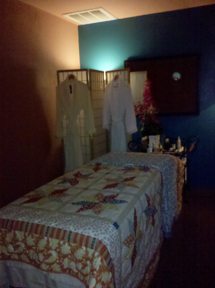 In 2003, I went to massage school and opened my own healing center. Once I got a taste of owning my own business, there was no turning back! Even though it can be incredibly challenging at times, I can’t ever see myself working for anyone else again. I guess I got spoiled! KM: From Corporate America to Alternative Healing, that is a leap! 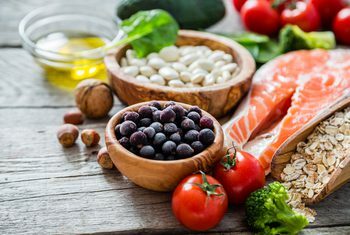 Can you talk about where your interest in alternative healing comes from and why you chose that avenue? TR:I have always been fascinated by alternative healing, and received my first therapeutic massage when I was in high school. Ever since then, I have had a deep connection with bodywork and energy healing. When I decided to leave Corporate America and move into a different direction, an intuitive I saw in Sedona suggested that I investigate a career in the healing arts. Since I already had a strong affinity for that type of work, it seemed like a natural avenue for me to pursue. I can’t get enough of it! KM: I am really enjoying your book “Opening the Kimono”. What impresses me the most is your authenticity and transparency and your ability to talk about those thinks that most of us want to keep to ourselves. As an author and artist myself, I understand how hard it is to be completely authentic. Many times I have put something out there and wished I could pull it right back because I was afraid of what people would think. I know you have had that feeling as well. Can you talk about the process of writing and how it changed you? TR: Writing Opening the Kimono was life-changing in that I finally started to reveal myself in the deepest, truest ways, both to myself and the outside world. I acknowledged, and even honored, the many aspects of shadow that resided (and continue to reside) in me. Once I started to reveal my biggest secrets, I discovered that there was tremendous personal power contained within them. The bigger the release, the stronger I became. It was the single biggest therapeutic process I have ever experienced. KM: Not only did it transform you when you shared yourself in that way but the reader is given permission to be okay with their shadow as well. I love that part! One of my purposes for doing the interviews is to show people that they can manifest their dreams by sharing with the reader, people who have done it. For example, you wrote a book and got it published and I am sure it was a long time dream of yours. I have dreamed of writing a book and having it published and had an agent. We were so close to getting it published but at the last-minute the publisher changed her mind. That was after making all of the changes she wanted to see, so I know how hard it is to have a book you wrote in your hands. Can you talk about what that process was like for you and how you got it published? TR: When I finished writing my book, I was torn by the direction I should take it. My head told me to find a traditional publisher, but my heart wanted it out into the world right away! After a lukewarm attempt to get an agent, I decided that I was unwilling to wait for months or years to see my literary baby delivered into the world. As a result, I took on the major project of getting it published myself. 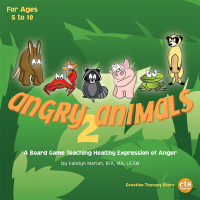 I had my husband edit it with me line-by-line, and we hired a professional advertising photographer for the cover art as well as two book designers to complete the book. I did all of the research to get an ISDN number, a Library of Congress registration, a self-publishing firm, and a distributing company. Since I was doing all of the promotion activities myself, I also figured out how to enter my book into award competitions, book fairs, bookstores and other key outlets. It was definitely a labor of love, and I am so very grateful that I took the initiative to do it all myself. It was all worth it! KM: I am glad you followed your intuition because it is an important book that will help a lot of people. 1. a magic charm, spell or influence. A black American concept, popularised elsewhere by its use in blues and rhythm-and-blues records of the 1950s and early 1960s. The word’s origin is thought to be West African, but no specific source has been identified. 2. mojo: that positive spirit toward what we are doing now that starts on the inside and radiates to the outside. 3. joie de vivre, that sense of being alive, joyful, and fully present in the moment. The path to finding your mojo differs for everyone. For some, mojo is a sense of purpose and meaning in your life. For others, it’s reclaiming optimal health or sparking their creativity. Some seekers find mojo by getting in touch with the divine, while others get their mojo by getting in touch with their sexual prowess. Okay, now I am really curious to find out what a Mojo Bringer is, aren’t you? TR: To me, mojo is the fire, the energy, the power that propels us forward to create juicy, magnificent lives. All of us have lost our mojo at one time or another, and there are simple, effective techniques that can bring us back to that place of unlimited power. In my keynote presentations, I talk about mojo busters (those things that sap our energy and cause us to live with mediocrity) and provide mojo boosters that can fill our tanks once again. Personally, I know that I am a happier, healthier, far more productive person when I utilize my mojo boosters. In fact, my nine year-old daughter made me a cheat sheet of my own program that I have taped to my bathroom mirror just to remind me every day on what I can work on! KM: That is awesome Theresa, a daughter that is following in your footsteps! Thank you Theresa Rose for taking the time to do this interview with me!